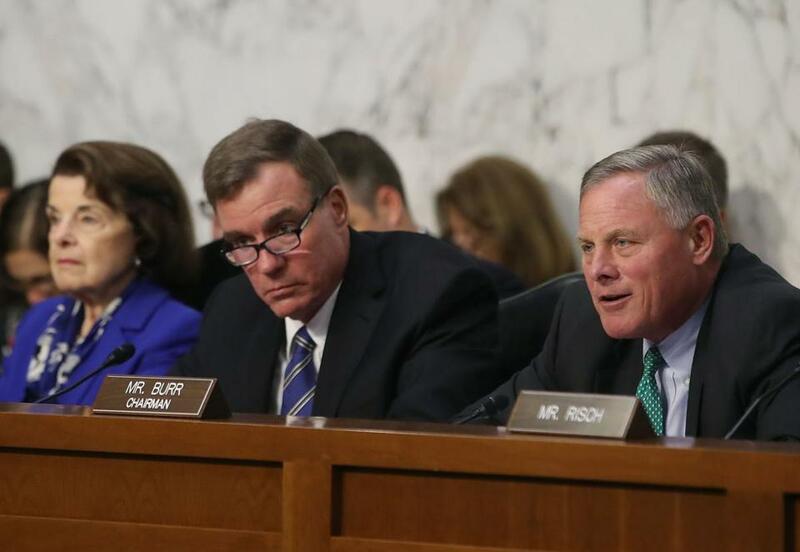 US Senator Mark Warner, center, during a Senate Intelligence Committee hearing, on Capitol Hill, on Wednesday. (Bloomberg) -- Senior executives from Facebook Inc., Alphabet Inc.’s Google and Twitter Inc. will testify before the Senate Intelligence Committee on Sept. 5 to discuss their efforts to prevent Russian meddling in November elections as internet researchers warned that Moscow still has active social media accounts designed to influence U.S. politics. The panel’s top Democrat, Mark Warner of Virginia, announced plans for the testimony during a hearing Wednesday about foreign attempts to use social media to sway U.S. elections, saying he wants to hear the companies’ plans and press them do to more. Warner didn’t specify who from the companies would testify, but a person familiar with the matter said Facebook Chief Operating Officer Sheryl Sandberg will be one of the executives at the hearing. Wednesday’s hearing was convened a day after Facebook announced it had uncovered a clandestine campaign to use its platform to exacerbate U.S. political divisions. The company deleted dozens of accounts and pages and notified the U.S. government. Some of the activity was similar to Russia’s efforts around the 2016 presidential elections, when Russian President Vladimir Putin ordered interference with the election to boost Donald Trump’s candidacy. “Even today, almost two years after the 2016 election, foreign actors continue an aggressive and pervasive influence campaign against the United States of America,” the committee’s chairman, Richard Burr, a North Carolina Republican, said at the hearing. He called on companies to address foreign meddling while balancing businesses interests and free speech. Warner said it’s becoming increasingly clear that the Russians previously caught interfering on social media were “just the incompetent ones who made it easy to get caught” and represent a fraction of the total Russian meddling effort. Researchers who have studied foreign efforts to influence U.S. elections told the committee that social media companies haven’t deleted all the accounts used by Russia to interfere in U.S. politics. John Kelly, the chief executive officer of Graphika Inc., which traces online networks, said that the firm’s research showed approximately 28 percent of publicly identified social media accounts from the Russian government-linked Internet Research Agency are connected to still-live accounts on other platforms. “We found a great deal of accounts,” Kelly said. Philip Howard, director of the Oxford Internet Institute, said countries beyond Russia are using the Internet to influence politics in the U.S., Canada, the U.K. and other nations. “It’s safe to say that dictators learn from each other,” Howard said. Facebook has promised to protect the U.S. and other countries from the influence of organizations seeking to interfere in elections, after failing to disclose the Russia-backed effort until long after the 2016 race was decided. The company has been hiring security analysts and coordinating with the governments on thousands of leads. Tuesday’s disclosure by Facebook underscores the increasing difficulty of staying ahead of ever-evolving strategies by those trying to take advantage of the platform. Facebook said in a blog post the unknown actors behind the latest campaign “went to much greater lengths to obscure their true identities” than Russia-linked groups had in 2016. In July, the Intelligence Committee’s strongly backed the finding of U.S. intelligence agencies about Russia’s activity in the face of resistance by Trump to acknowledging the conclusions of his own intelligence community.